"Chicken breasts marinated AND baked in Italian-style salad dressing! Breaded, easy, delicious. Now THAT'S Italian!" 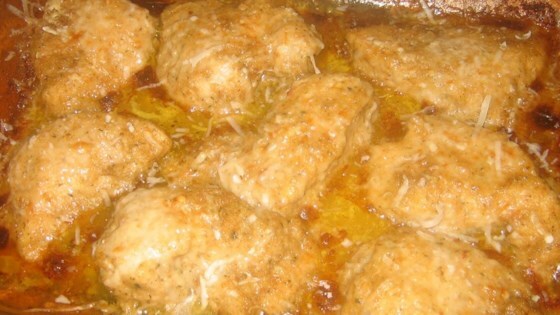 Place chicken breasts in a 9x13 inch baking dish. Pour salad dressing over chicken. Cover dish and refrigerate for 30 minutes to 1 hour. Roll each chicken piece in stuffing crumbs. Return to baking dish. Cover with aluminum foil and bake in the preheated oven for about 45 minutes or until chicken is cooked through and juices run clear. See how to make a simple herb-rubbed roast chicken, Italian-style. Very quick and easy. I would use less dressing. One cup is probably enough for next time. This is good. The chicken is tender and tasty. I added a little melted butter on top of the bread crumbs to help it get crispy. Very tender and flavourful. I also added some italian seasoning, and some garlic powder. Instead of breading the breasts, I cut them into strips and cooked them, covered, in the marinade. Yum! This was SO very easy and sooo good!! I didn't use 2 cups of dressing though, about 1 or so, it was VERY GOOD!! Thanks Robin!! I thought this recipe was as simple as it gets, and my very fussy boyfriend loved it. Thanks and I highly suggest this one for on the run people.